It is estimated that up to 3,000 people a day would use the new Dublin City Library. DUBLIN CITY COUNCIL is on track to submit its planning application to build a new Dublin City Library in Parnell Square. The proposal for the development at 20-21 Parnell Square, which will form part of the new Parnell Square Cultural Corner project, was announced in 2016. Use of the former Coláiste Mhuire Irish school was also included in the library proposals. In 2016, the project said this library, will be “a window on the world of knowledge and culture, a centre of learning and literature, a commune of research and reading and a hub of ideas and creativity”. The council has requested An Bord Pleanála carry out a scoping assessment of two of the buildings included in its original proposal. This assessment will provide it with the information it needs for the Environmental Impact Statement it will submit for its application this year. The initial proposal in 2016 said the library would include a digital library suite for IT-based learning, a music hub, a space for jobseekers and small business entrepreneurs and facilities for emerging writers. Dublin Inquirer reported last year that the estimated cost of this project had jumped from €60 million when it was first announced, to €100 million, with plans for the council to take a loan from the European Investment Bank (EIB) to raise the additional money to finish the development. Last month it was reported that a new government strategy for libraries would see all late fines across the country wiped. Extended opening hours are also included in this plan to encourage people to return to their local libraries. It is estimated that up to 3,000 people a day would use the new Dublin City Library. It is expected the council will apply for planning permission later this year with plans to open the new library in 2022. Email “Council presses ahead with plans for multi million euro Dublin City Library”. 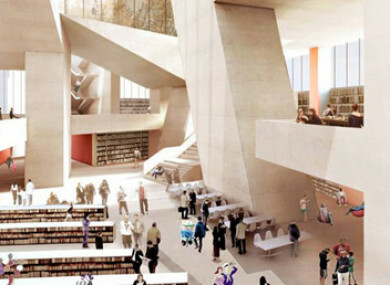 Feedback on “Council presses ahead with plans for multi million euro Dublin City Library”.